If you’re looking for a cabin with a cozy and stylish layout, you can’t go wrong with this Savannah Park Model. It’s made by Rustic River Park Homes, which is located in Hamilton, Alabama. 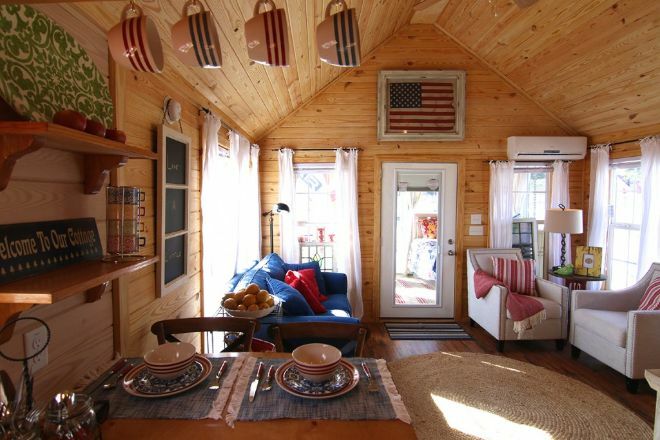 The company specializes in handcrafted park homes using all American products. 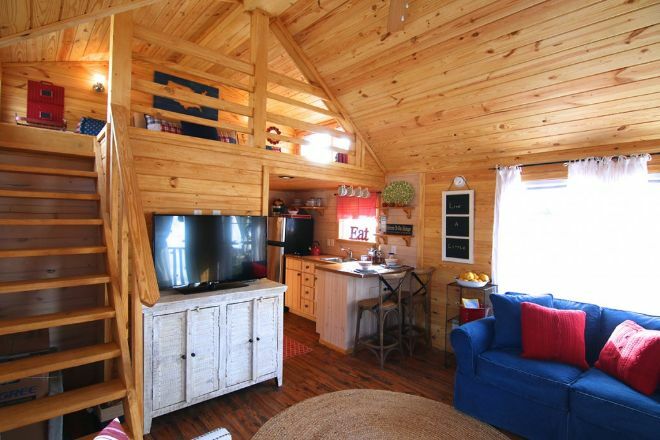 They’re experts in the rustic cabin style. This floor plan makes the most out of the limited space. It packs in two bedrooms off to the right and has a separate bath off of those. Across from the bathroom is a kitchen, which then leads into a living area. 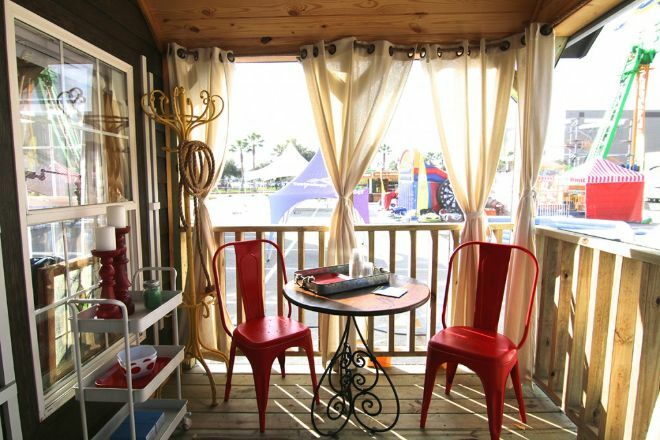 Off of that is the porch area, accessed through a full-windowed door. The model also has stairs off of the living room, leading up to a lofted area. 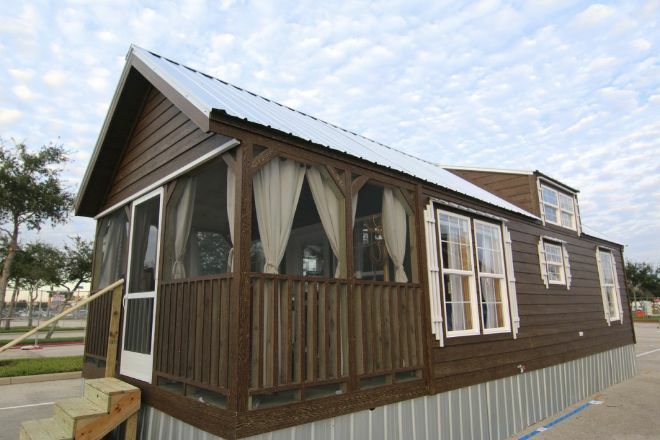 The exterior of this model just screams cabin the moment you see it. Between the dark, textured wood, white window accents and metal roof, you know you’re looking at a top-notch rustic retreat. The living area is perfectly designed to fit in sofas and armchairs, while still allowing plenty of open floor space. A small dining area also fits in perfectly, coming off from the kitchen area. As you can see, this floor plan is a little more segmented, fitting the kitchen back into its own space. It’s great for those who like their floor space more clearly defined, instead of open. The lofted area still creates a more open feeling, however, so the space doesn’t feel too cramped. The porch area gives off a spacious view. This is a wonderful feature for a cabin placed out in nature, especially right by a lake. 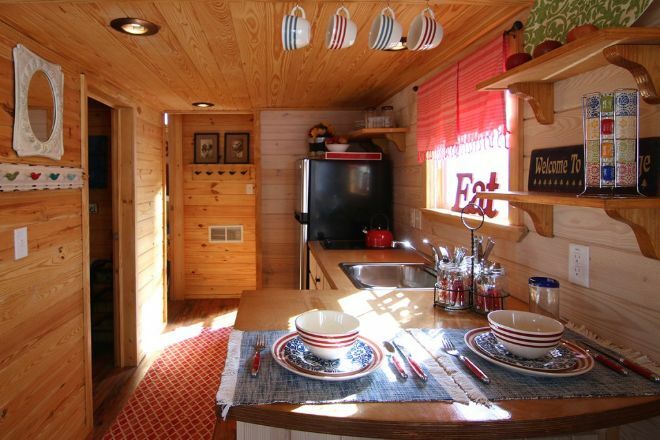 This kitchen comes with a full-sized refrigerator and a cooktop. The countertop space makes a perfect dining area. Vinyl flooring makes for easy cleaning. 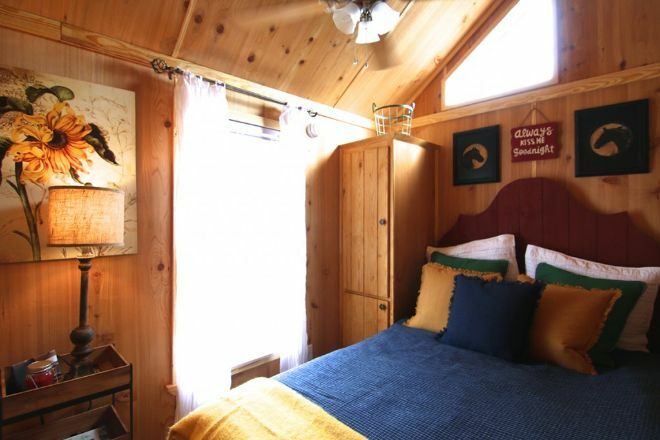 The bedrooms offer plenty of natural lighting, between the side window and the window above the bed. Custom handcrafted cabinets allow for plenty of storage. 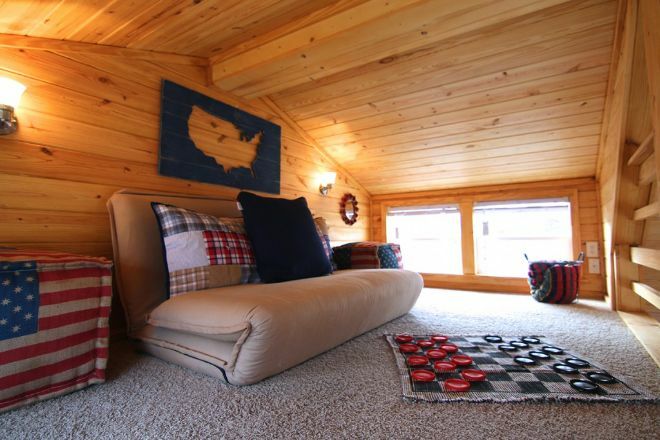 Perfect for relaxing, this loft space comes carpeted. It would make a great crafting area or play area for children. A small futon would make instant extra sleeping space. What do you think of this park model? If you like it as much as we do, please SHARE it with your friends on Facebook to spread the love.